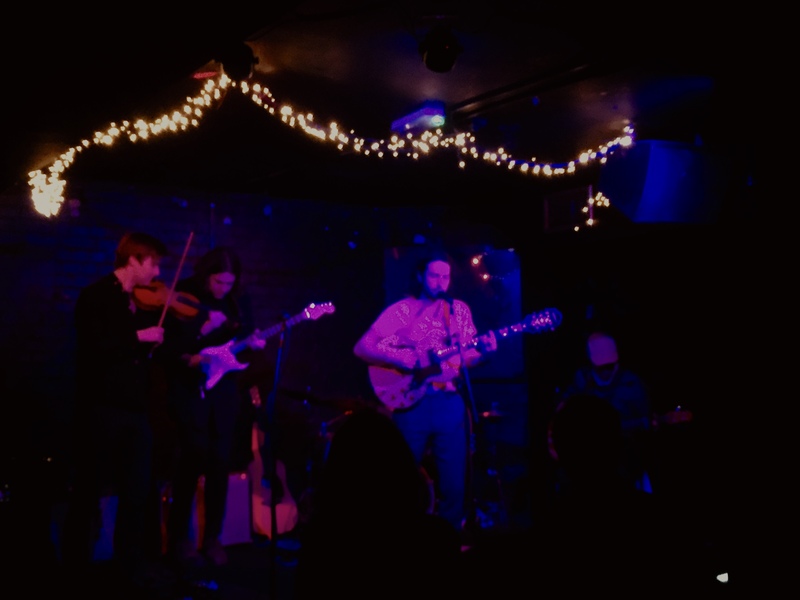 Jeremy Tuplin and his band (The Ultimate Power Assembly) took to the stage in what was an overcrowded and intimate affair in the candle-lit basement of the iconic folk circuit venue, The Slaughtered Lamb. Opening with the more autobiographical ‘Can We Be Strangers’, the set-list continued with all the songs from his latest album, Pink Mirror, alongside older classics such as ‘O Youth’ and ‘Albert Einstein Song’. Significantly, the placement of the opening, middle and closing tracks were punctuated by the social commentary on the modern world from new tracks such as ‘Love’s Penitentiary’ and ‘Pandora’s Box’, with ‘The Machine’ placed somewhere in the middle, before closing the night with one of my favourites: ’The Beast’ allowing Jeremy’s own vulnerabilities as a writer to come through structurally in balance to exposing human natures dark sides. Tuplin’s crowd interactions were nothing short of sharp commentary in-between songs, framing his understated and dry humoured character, levelling that of his singer-songwriter personality. Sharply astute to the trajectory of his laconic lines upon his listeners; we followed his poignancy with equal measures of laughter, often double taking what we heard, re-considering our interpretations before digesting hidden irony. We fed off his idiosyncrasies and were all here tonight in what Jeremy described to us as an “album awareness concert” for his second album: ‘Pink Mirror’ (officially released: 5 April). We watched on as band and solo performances were separated by the non-performing members covering themselves with white sheets, like little ghouls upon stools. Tuplin even donned a pair of rose-tinted shades for ‘Pink Mirror’, “these are meant to be pink, but you can’t really see that. Well worth 15 quid” he jested. As the evening developed it was really intriguing how Jeremy engaged with his audience – it was not only the familiar warmth, “It’s great to see so many of you, loads of music people, my friends and family, and strangers too, soon to be friends, I hope” but that role he takes as a performer and writer. His deadpan baritone delivery and half rhyming poetry navigated its way to our hearts. Essentially identifying that we are all flawed human beings, and making light both lyrically and through stage props, offering his performance as a both a piece of art – a gift conjured from dreams – and a sharp depiction of reality. In reverse, life imitates art with the song: ‘The Machine’; in his day-to-day life as a writer something begs him to question and reflect upon his life and profession: “Then I think of everything I do, think feel or see, it barely contributes to the economy” and yet we do also “suffer these same internal dialogues”. Whether life imitates art or his art imitates life itself, Jeremy, however consciously, has developed a voice of his own and narrates the chaos of life and the intimacy of desire, vanity and representations of love in a way that is both pensive and witty. He is without doubt one of the most subversive songwriters and performers of our generation.